The reactivity of a nuclear reactor is the most important safety and operating parameter. Due to short reactor period, the Light Water Reactor (LWR) designs require the compensations of rapid unfavorable reactivity increases. The increase in fuel or moderator temperature leads to compensate the reactivity jumps as inherent safety characteristics. The safe and reliable reactor operation requires the accurate assessment of these reactivity changes. This paper highlights the improvements in the methodology to determine the feedback reactivity changes in IAEA MTR benchmark. This method incorporates the reactivity effects of fuel temperature in moderator regions and vice versa. For this purpose, a detailed 3D model of the IAEA 10 MW MTR benchmark reactor is developed employing OpenMC computer code. OpenMC is a probabilistic computer code for neutronic calculations. This work uses temperature-dependent JEFF 3.2 cross-sectional library. The model is validated against the reference results of eigenvalues for control rods (inserted and in fully withdrawn position), control rod reactivity worth, averaged thermal flux in the central flux trap, and power fraction for each fuel element at beginning of life. The validated model is applied to simulate the feedback reactivity coefficients against the conventional reference results. In order to improve the methodology, the effect of the moderator temperature and void on fuel is incorporated to obtain a more realistic value of the fuel temperature coefficient. Similarly, the moderator temperature coefficient and void coefficient are improved by incorporating the coupling effects of fuel temperature on moderator. This methodology can be applied to improve the LWR designs. 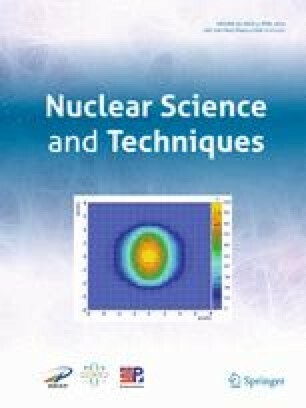 The authors are grateful to Department of Nuclear Engineering (DNE) and PIEAS for providing computational resources in the Advanced Computational Reactor Engineering (ACRE) lab.